Canberra is one of the best places to live in the world. It is a progressive city that has successfully maintained its strong unique character and heritage while changing and adapting to how we live and what we want from our city. Canberra is known for the great lifestyle it provides, its open green spaces and tree lined streets and the style and benefits of a well planned city. It is also a city of diversity and equality that provides opportunity for us all to enjoy it in different ways. The heart of our city is an integral part of our city's character, its diversity and the change to a more urban modern city. And just like you, we love the city centre but see the potential to make it even better. We have been seeking your feedback on what makes Canberra such a great place to live, explore and enjoy. We have also asked for your ideas on what we can improve to make sure it continues to be a great city. Thank you for all your help, the contributions and feedback. You have clearly told us that while there are opportunities to improve our city centre it is important changes reflect the great character, style and atmosphere that makes our city the best place in the world to live. The information you provided was used by the newly established City Renewal Authority to guide improvements to Canberra’s city centre. The engagement via the below tools has now closed. Visit the current city activation engagement page to continue the conversation and have your say. Garema Place and Civic Square were recently home to Pic & Mix, a temporary picnic area created by the City Renewal Authority which consisted of 18 large picnic tables and colourful umbrellas. Garema Place is one of the most active areas in the city centre and the Pic & Mix pop-up picnic area created a comfortable place to pause and enjoy a bite to eat from one of the local food outlets or to just sit and mix with friends or colleagues. Similarly, Civic Square people were able to use the tables when visiting Canberra Museum and Gallery, Canberra Theatre, the library and nearby businesses. Pic & Mix was in Garema Place for four weeks and Civic Square for one week. The City Renewal Authority had asked members of the public what they thought about Pic & Mix and ideas for activating the community space via our email at cityrenewal@act.gov.au, the survey below or through social media at #picmixCBR and Facebook @cityrenewalcanberra . Thank you to all those people who had their say. The information we gathered will help identify new ways to activate public spaces in the city. To help us evaluate the success of the Pic & Mix picnic area, we would like to know what you think of this new space. If you'd like to provide your feedback, please complete the 5 minute survey below. Any further comments or feedback. The ACT Government has had a strong tradition of providing and supporting community Christmas events across Canberra including in the city where Christmas celebrations have focused on a large Christmas tree and lights on City Walk in recent years. In 2017 the ACT Government hosted a Christmas festival in Glebe Park. Christmas in Glebe Park was a festive family friendly community event with activities including tree decorating and a chance to meet and have your photo taken with Santa. It ran over three weekends in December leading up to Christmas with activities starting during the day and operating up until 10pm at night. To help us evaluate the success of Christmas in Glebe Park and to plan for future years, we asked members of the community to let us know their thoughts on the event and the type of Christmas event they prefer in the city. People were able to share their thoughts and give feedback online (see the survey below), through feedback forms and directly with ACT Government staff. Most people enjoyed the event, with 87% rating it as good, very good or excellent. Nearly three quarters of those surveyed did not attend a Christmas event in the city the previous year. The most popular reason for attending the festival was the activities and entertainment available (50%), followed by the Christmas lights display (40%). Most respondents (73%) attended the festival for longer than an hour. The majority of people attended the festival with their family (73%) or with friends (22%). The location of the event (3.55/5) and ease of access (3.97/5) rated highest with patrons. The quality of activities and entertainment (3.06/5) and the food and drink options (3.12/5) were considered good but did not rate as highly as other aspects of the event. Almost all respondents (94%) said they we likely to recommend the event to friends, family and colleagues. Facebook (45%), word of mouth (31%) and the media (12%) were the most common ways people found out about the event. The festival approach to Christmas celebrations was supported by the majority of respondents (65%) while only 12% supported having a Christmas tree in the city with a one-off a concert. 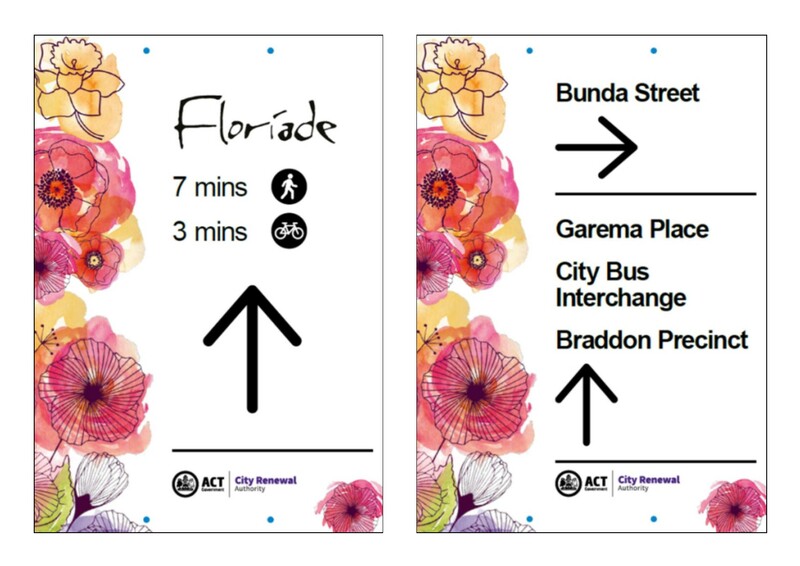 In 2017, to assist people travelling by foot or bicycle to and from Floriade from the city, the City Renewal Authority installed over 60 wayfinding signs, including some with travel time estimates. Two examples of the wayfinding signs installed between the city and Floriade. 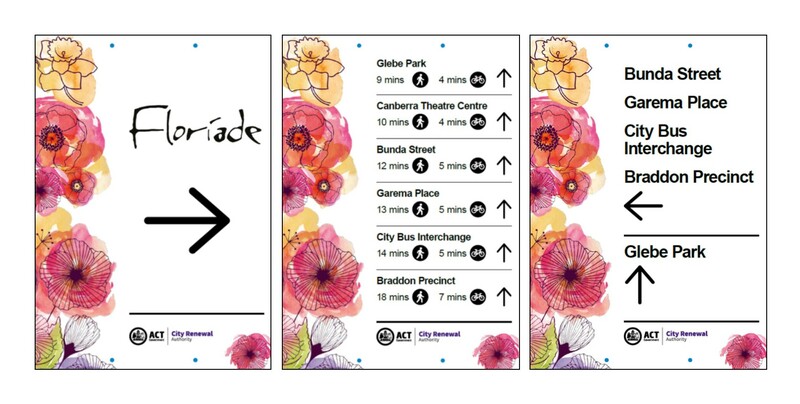 To help us evaluate the success of the wayfinding signs, we would like to know how you got to Floriade this year and your thoughts on the signs. How did you travel to Floriade this year? What form of transport did you use for the largest part of your journey? When travelling to Floriade, where did you start your walk or cycle from? How helpful and informative are the signs? Did the signs change the route you took to get to Floriade? ----Yes - it saved me a lot of timeYes - it saved me a small amount of timeNo - I was going that way anywayNo - it was confusingI did not notice the signs. What other information could be included on the signs? You have 255 characters left. Do the signs increase the likelihood of you walking between the city centre and Commonwealth Park in future? Rate how more likely you are to walk between the city centre and Commonwealth Park when 1 is equivalent to no more likely and 5 is much more likely. Joining us at activation events (listed on the right). What is your favourite place in our city centre and why? CLOSED: This social mapping activity is now concluded. You can view the ideas by clicking on them. What could be changed to improve our city centre? What's your vision for Canberra's city centre? Develop events which include a diverse range of businesses and stakeholders. We have used this document to gain an understanding of the city's potential . We continue to work with Canberrans to create a vibrant and active city centre that reflects the best of Canberra.